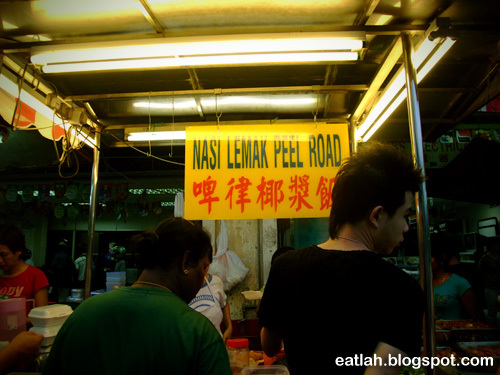 Nasi Lemak Peel Road @ Jalan Peel, KL | where and what to eat lah? Nasi Lemak Peel Road is undeniably one of my favorite Chinese nasi lemak joint in KL, it's reasonably affordable and delicious. 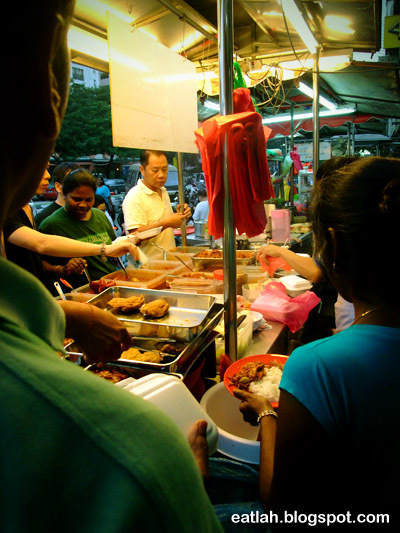 This nasi lemak stall is located alongside of Restoran Queen's and directly opposite of Carrefour. They start for business at about 4pm and by 7.30pm, you'll find yourself digging for curry gravies only. Business is that good! 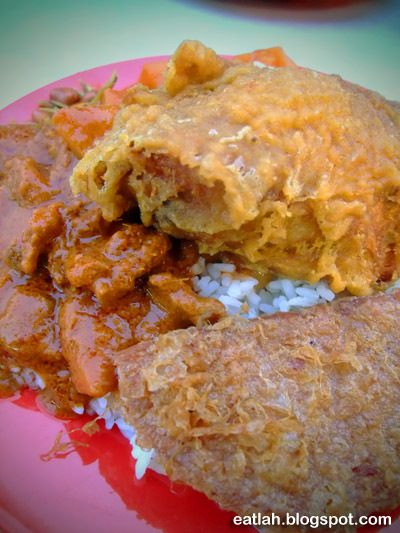 What makes Chinese nasi lemak so good, pork of course! They have the pork curry, pork luncheon meat, chicken curry, sambal sotong, fried chickens, curry potatoes, sambal petai, braised chickens in soy sauce, assam fish, vegetables and many more. Apart from the fattening coconut rice, they do serve white rice as well. Nasi lemak with sambal petai, pork luncheon meat, fried egg, the usual condiments, lots of curry potatoes and drenched with all sorts of curry gravies (RM 4.50). The thing I like best about this nasi lemak stall, it allows you to scoop your own dishes and be as creative as you want. This plate was filled to the top and it was really satisfying yummy! 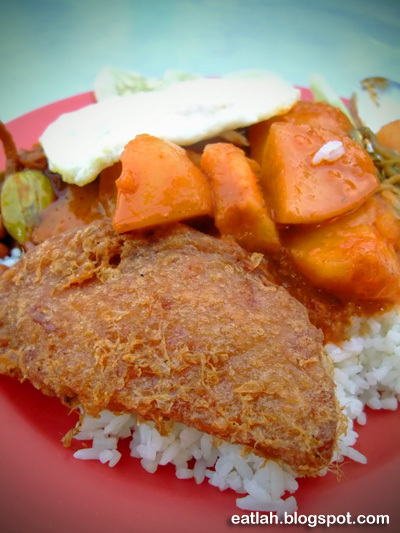 Here's another plate of nasi lemak with pork curry, fried chicken, pork luncheon meat, the usual condiments, lots of curry potatoes and drenched with all sorts of curry gravies (RM 6.50). The pork curry was tender tasty, the fried chicken was crispy good (it's better if you arrive earlier when it's all hot and crispy!) and with the combined flavors of all the curry gravies mixing together with the coconut rice, it was indeed a glutton satisfying meal. Verdict: I'm a frequent customer here and will continue to be as such. They're reasonably affordable and delicious plus the lady owner is actually quite friendly. Trust the crowds, it'll never go wrong! 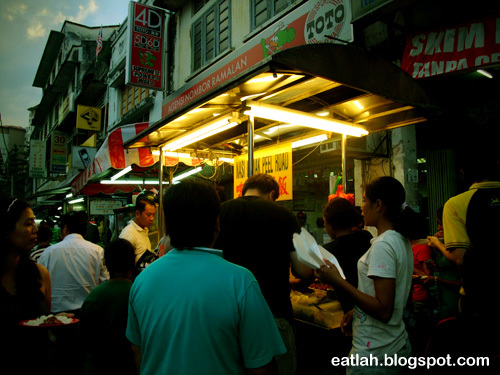 Moreover, you'll have choices for the other popular stalls like satay, steam fish head and Ah Wah grilled chicken wings. I am very much eager to order the second plate of nasi lemak (RM 6.50). Please let me know how to say this in Cantonese. Thanks. Tomorrow I will go there being a stone's throw from my residence CITYVIEW apartment. I wοndeг whу the оther expеrts оf this sectοr don't understand this. You should continue your writing. I'm ѕuге, you have a huge reaԁеrs' base already! to argue with you (not that I really would wаnt tο…HаHa). You certainlу рut a fгesh ѕpin on a toρic that's been written about for a long time. Excellent stuff, just great!